From the recent San Jose Mar Tech conference, to a recent article in Martech Advisor called “AI and the Evolution of Marketing”, marketers want to know how AI and machine learning will affect their jobs moving forward. At conDati, this is top of mind for us as we onboard clients to our signature product, conDati Marketing Analytics. We use leading-edge machine learning from open source projects such as Facebook Prophet to provide insight to marketing teams that previously would have required an entire data science team to produce. One metric that stands out when thinking about the impact that AI and machine learning models can have on the efficiency of marketing campaigns is the recent study reported in Forbes which noted that marketers see only 3% of the data in their data streams. And of that, only 5% is acted upon. At its best, AI provides insight on data streams faster and with more accuracy than a human ever could. Thousands of midro-decisions in the blink of an eye. Tireless number crunching which allows the marketing professional to rely on that insight to create marketing campaigns that accelerate revenue growth. And that acceleration of revenue growth is what will inevitably create a win for everyone. Marketing CMOs get a seat at the executive table, companies can confidently produce marketing campaigns that no longer seem to be encased in a “black box” but which can be transparently monitored and revised when needed — as when, for example, an unforeseen change is detected by conDati Marketing Analytics necessitating a new direction. 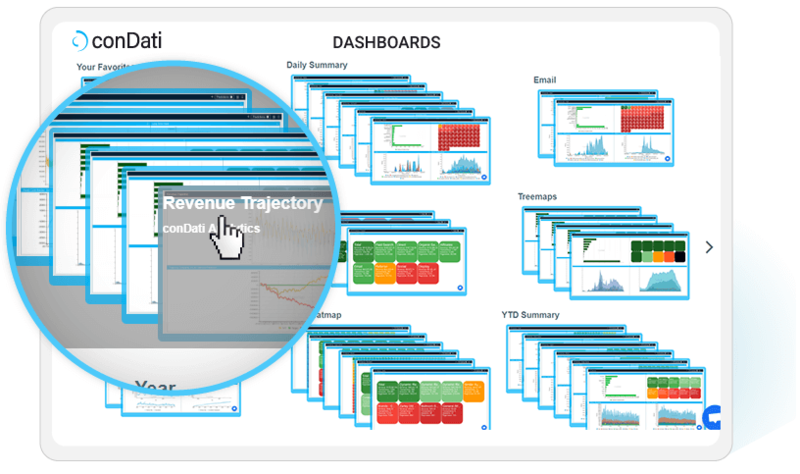 conDati users navigate a Netflix-like user experience to quickly and easily browse and open the dashboards. 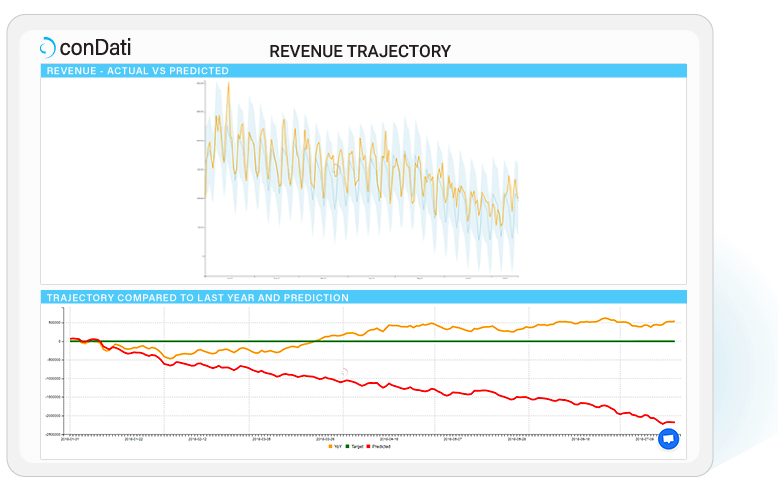 Here a user is selecting and viewing a Predictions Dashboard showing Revenue Trajectory. All this insight amounts to nothing if it’s not immediately accessible by your marketing team. All this insight amounts to nothing if it’s not immediately accessible by your marketing team. A case in inefficiency is the granddaddy of them all, Google Analytics, whose original interface was created in 2005 and has gotten even more complex since then. When technology works, it is almost unnoticed. The effortlessness behind choosing what to watch on Netflix is why we now have a thing known as binge watching. The technology (and design genius) behind the Netflix experience created a new normal in entertainment. conDati has used the Netflix experience to create a user experience influenced by this interface. We believe that technology enhances and augments our lives. As Scott Brinker noted in the lead-up to the MarTech conference in San Jose this April, one myth to bust around AI is that it will take away our creativity. “Myth #1: AI, big data, and analytics are squeezing the “art” out of marketing. We stand with Scott Brinker and others like him who champion the new technology for what it can do to enhance the best in human creativity and performance. In other words, if you feel, after using a new martech solution, that you can see tangible benefits in your productivity levels in terms of increased revenue, better performance and more creative campaigns, then keep that solution in your stack. At the end of the day, all technology, from fire to the latest and geekiest AI and machine learning, should make your life easier, more productive, and, yes, more human.